1 Begin by getting your pan nice and hot over medium high heat. Pour some oil and sauté the beef until cooked through. 2 Drop in the Knorr Beef Cubes for that extra meaty flavor and all the other ingredients except macaroni and cheese. Continue sautéing until the veggies are cooked. 3 3. 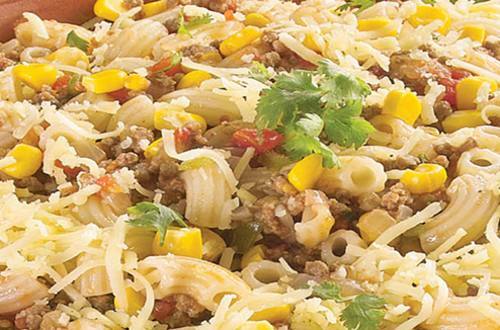 Drop in the cooked macaroni noodles next, mix well and that’s our dish. 4 Serve Mexican Macaroni with grated cheese on top and nacho chips on the side and see that it’s a magical dish. It will disappear before you know it!